태조 3년(1394)에 진충귀(陳忠貴)에게 내린 의주목사로 임명하는 사령서이다. 진충귀는 태조 2년(1393)에 청절제사로 양광도에 파견되었으며, 태조 5년(1396)에 경사에 파견되고, 태조 6년(1397)에 양천식 등과 경사에서 돌아왔다. 태종 12년(1412)에 사망했다. 이러한 사실은『조선왕조실록』에 간략히 기술되어 있을 뿐 다른 사서에서 진충귀에 대한 기록을 찾을 수 없다. 이 왕지는 조선을 세울 때에 활약했던 인물들을 연구하는데 좋은 자료이며, 성주도씨 문중의 왕지와 함께 귀중한 자료로 평가된다. 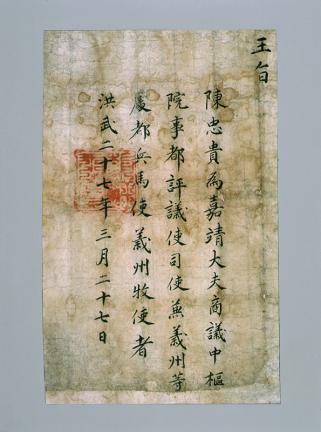 This Royal Edict is a letter ordering the Magistrate of Uiju to appoint Jin Chung-gwi in the 3rd year (1394) of the reign of King Taejo, first King of the Joseon Dynasty. Jin Chung-gwi was dispatched to Yanggwangdo Island as Cheomjeoljesa (Deputy Commander) in the 2nd year of King Taejo’s reign (1393) and sent to Gyeongsa in the 5th year of King Taejo’s reign (1396). He then returned from Gyeongsa with Yang Cheon-sik in the 6th year of King Taejo’s reign (1397) and died in the 12th year of King Taejong’s reign (1412). This fact was recorded briefly only in the Annals of the Joseon Dynasty; no record on Jin Chung-gwi was found in other history books. This royal order provides important information in studying historical figures who had made a great contribution to the establishment of the Joseon Dynasty. It is considered to be a precious material along with the royal edict of appointment kept by Seongju Do’s Clan.